Professional or technical education, India or abroad - It’s time to fuel your dreams. Get ready to fund all kinds of educational expenses such as rising tuition fees, books, room, boarding, computer and student travel. It is boon for the students who need financial support. Axis Bank offers an excellent opportunity to the students who want to study in India or abroad for their higher education. The bank provides student loan to the candidates who have secured admission in a reputed university/institution in India and abroad through common entrance test/merit based selection process. Also, Axis Bank Study Power aims to provide AXIS Bank Education Loan to deserving students who have obtained admission to career based courses namely Engineering, Medicine, Management, etc. There is no margin for education loan up to Rs. 4 Lakhs. For education loan above Rs. 4 Lakhs, the margin is 5% for studying in India. 15% margin on education loan above Rs. 4, 00,000 for abroad. 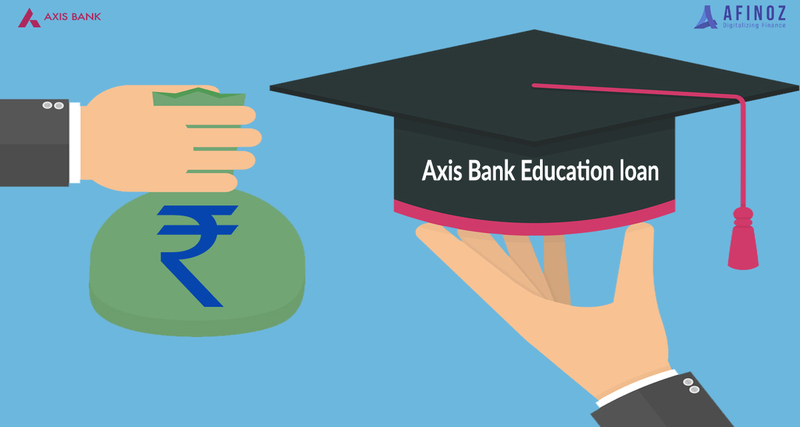 Processing Fees: There are no processing fees and other charges for availing Axis Bank education loan. Maximum up to Rs. 75 lakhs* for studies in India or abroad. Tuition fees, hostel charges (if any), cost of books, etc. will be covered under Axis Bank student loan. *The student loan amount is subject to eligibility and creditworthiness. Easy Loan Disbursal: Within 15 working days of receipt of the filled application along with all documents required by the bank. Customized education loans with flexible repayment schemes. Instant approval & quick disbursal. Up to 100% education finance. Facility of principal amount payment after the completion of the course. Applicant needs to fulfill specific eligibility criteria to avail a student loan. Latest salary slips showing salary being credited or Form 16 along with recent salary certificate. Bank Statement/Pass Book for last 6 months. Proof of admission letter from the university or institute along with fees breakup. Marksheet/Certificate of S.S.C., H.S.C, degree courses. Special Note: Rates are subject to periodic change. Afinoz is India's reputed and trustworthy online financial marketplace for availing loans and investment products. Our main objective is to make the process of getting a loan or making an investment safer, convenient and hassle-free for individuals. Plus, there are attractive offers available. We work with public and private banks, NBFCs and mutual fund houses across the entire country and offer an unbiased quotation on financial products. You can contact our team to get more information or apply for a loan or investment by calling on +91 120 411 0376 or by emailing at info@afinoz.com. Afinoz.com provides solutions which are quick, reliable, transparent, confidential and above all free.